One day early, but that's better than late, right? 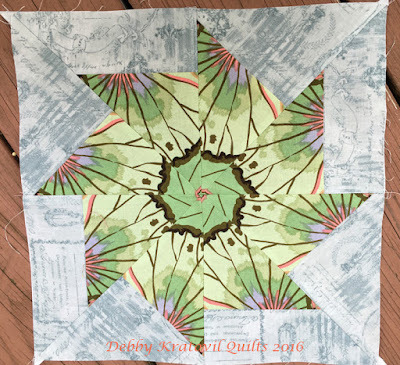 Here is the 8th project in my 2016 Calendar Girls BOM. 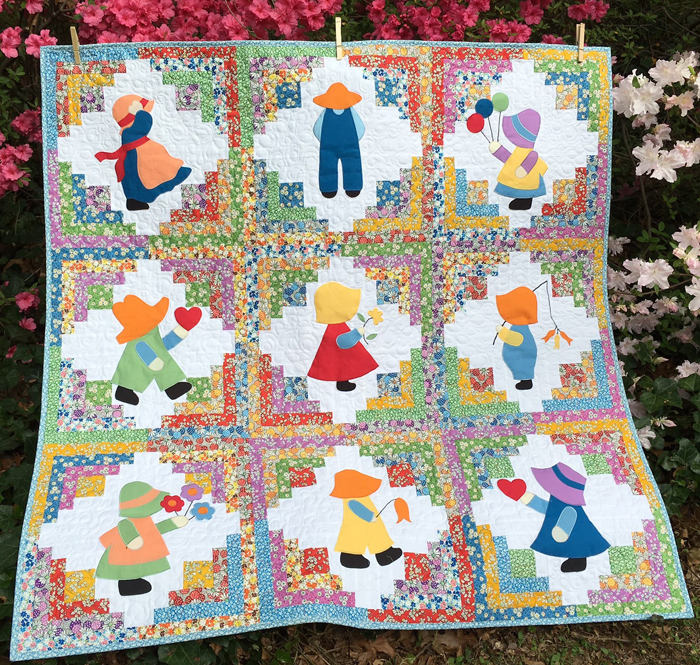 I have heard from several of you who are making these into baby quilts and what a stash you will have! 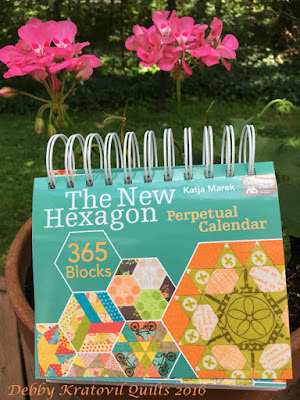 In the calendar it is a 16" block. 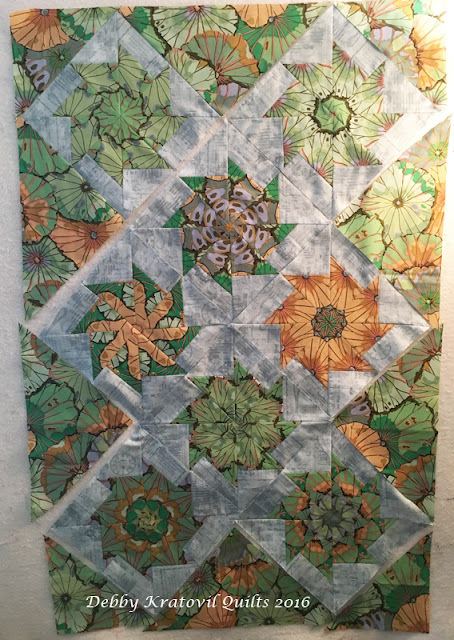 For our project, the quilt finishes to 36" x 36". 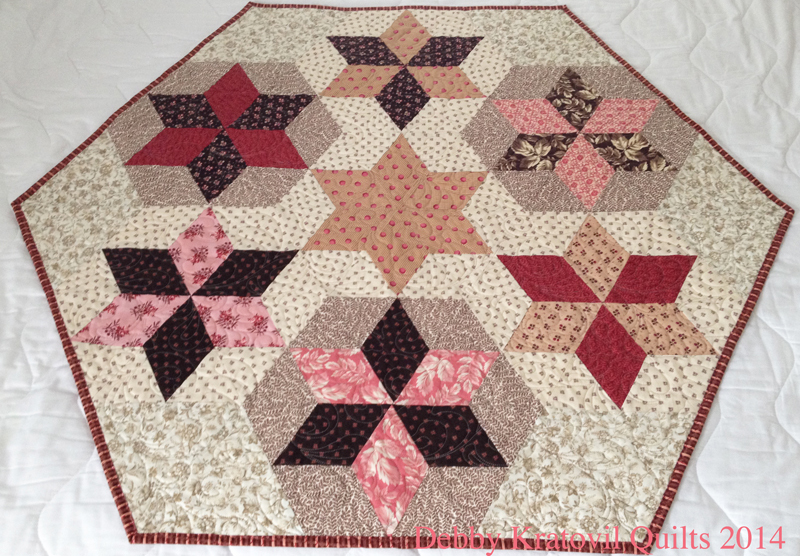 Free Trade Stars Quilt, 36" x 36"
Yes, back to back Christmas in July blog posts. This one will be with Windham Fabrics and I will be featuring the Storybook Christmas Collection. Let me give you a sneak peek at the fabrics. If you don't like 1930s prints, you can leave now! But if you don't come back on Tuesday (August 2), you won't see my tutorial on how to cut hexagons - any size hexagon - using a 60 degree ruler. That means, you don't have to have a template for each size. Just a trusty POWER TOOL! 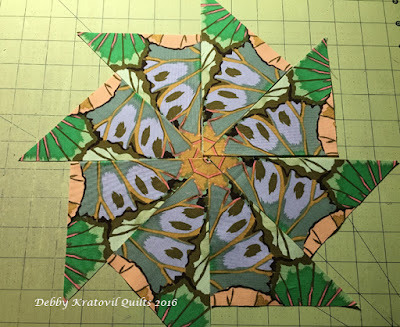 My project uses hexagons and I'll show you how simple it is to cut those incredible shapes. This is not original to me, but I love to share these sorts of things when I discover them. (And I can't even remember where I first saw it, but let's just say that the BIG ruler companies like Creative Grids, don't even have this information - yet). Windham knows that I enjoy working with their 1930s collections. 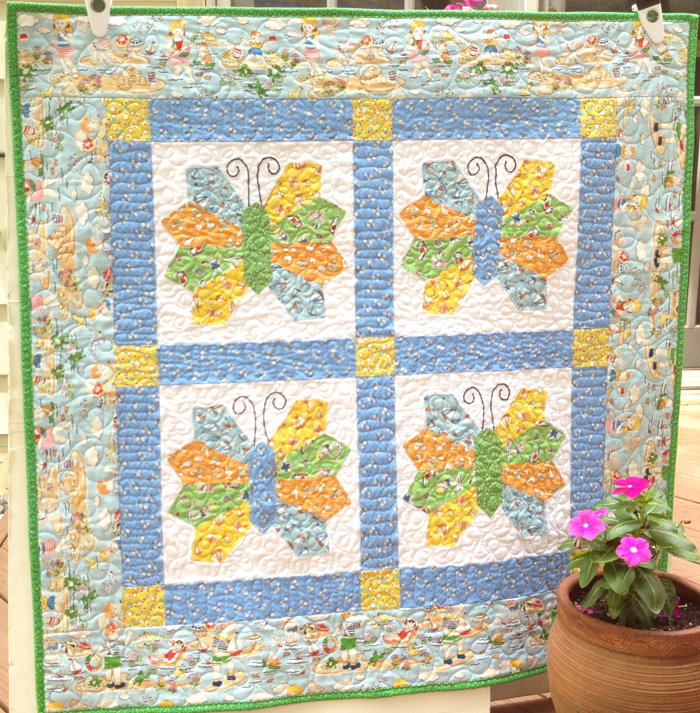 This Storybook Vacation Butterflies pattern has been a BIG hit selling at the Keepsake catalog web site. 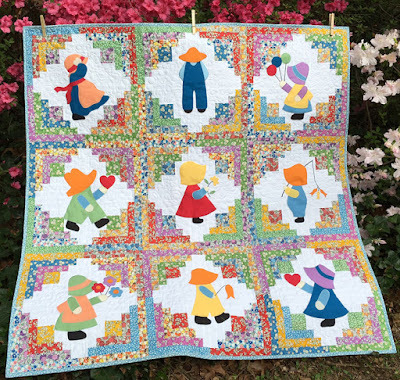 Such a simple quilt but I think it's the sweetness of those prints that captures the hearts of that small - but strong - group of quilters who enjoy working with those fabrics. Come back on Tuesday to see what I have planned. 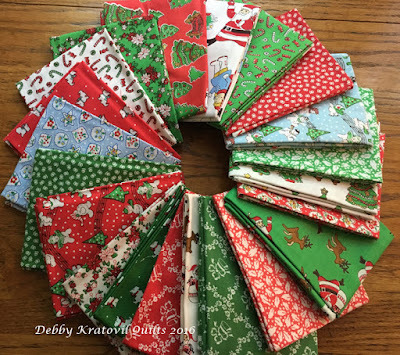 There is a FABRIC GIVEAWAY of a fat quarter bundle of the Storybook Christmas fabrics to my winner. 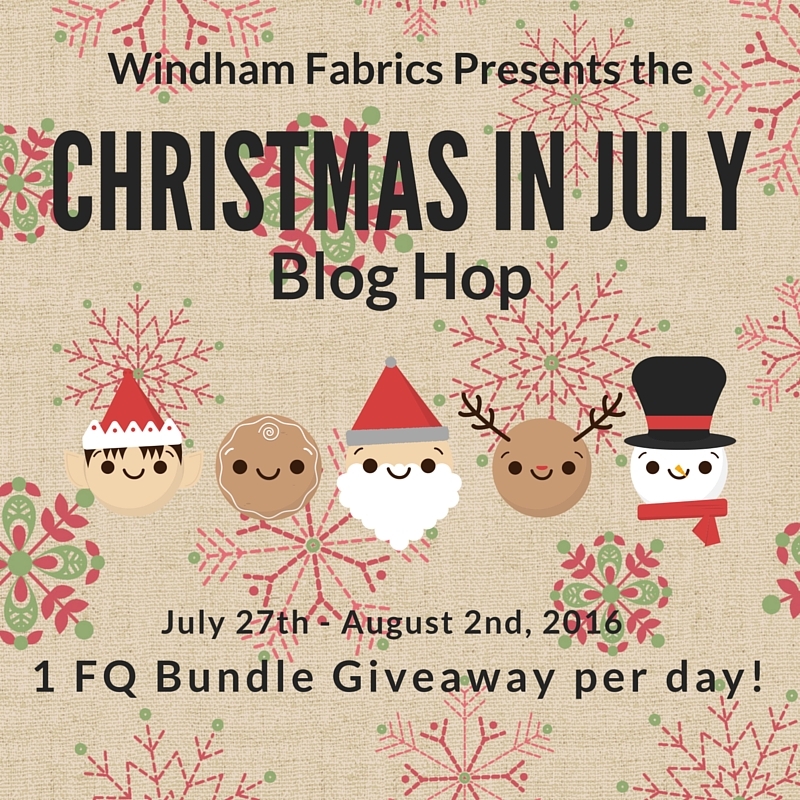 Go check out what is happening RIGHT NOW at the Windham Fabrics Christmas in July Blog Hop. See you back here on Tuesday. 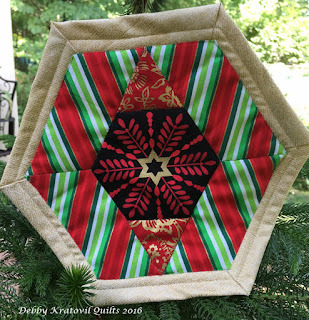 And remember, my Christmas in July contest (with Benartex) is still open until midnight Friday! 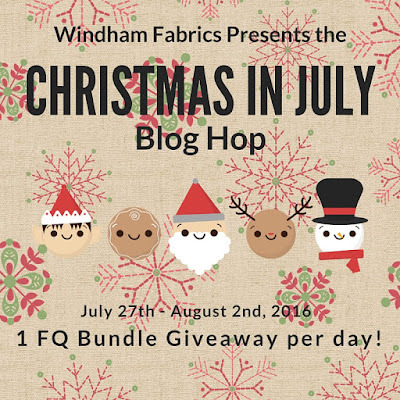 Christmas in July with My Little Chickadees and Fabric Giveaway! 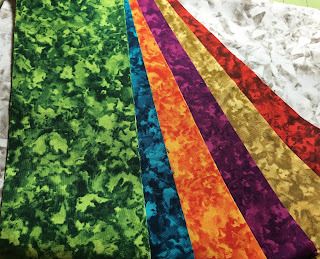 Look at these fabrics. You would have a hard time choosing, too! 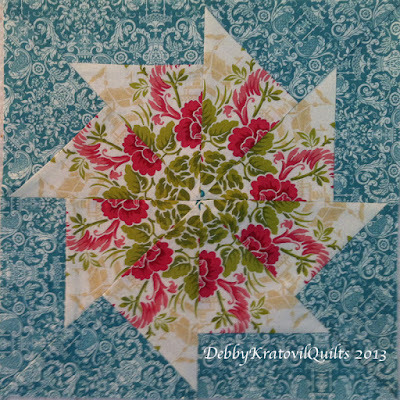 And here's a block I finished just yesterday. 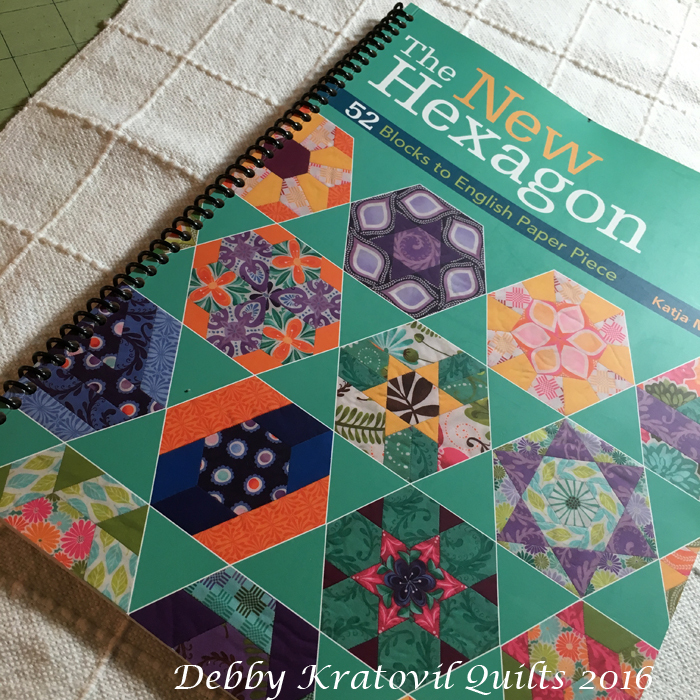 It is Block #30 in The New Hexagon book. But I had to change the name. The book spells it: Debbie. Gasp! That's not how I spell my name, right? 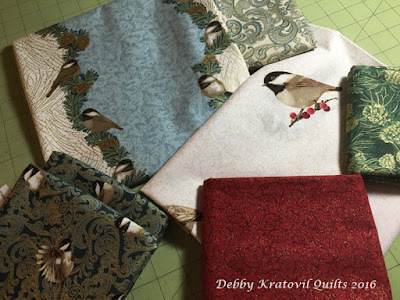 Go take a visit to Sew in Love with Fabrics to see what I did with these fabrics. They are fun and sweet and I know you will be inspired. Or at least, they will bring a smile to your face! 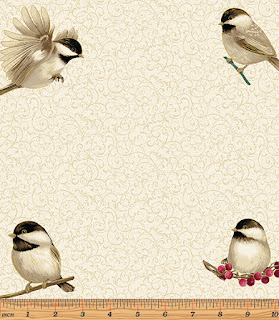 The GIVEAWAY for this posting will be a fat quarter bundle of My Little Chickadee fabrics. Remember, there is a FABRIC GIVEAWAY not only today but every day this week. Here is the schedule in case you missed it. Just leave a comment here on my blog about what you liked best in the tutorial using My Little Chickadees. The contest is over Friday night at midnight. Contest winners are limited to USA residents only at this time. Whoa! It's 100 degrees outside and I'm thinking Christmas? Of course; it's July! This week is the Christmas in July Blog Hop for Sew in Love with Fabrics (Benartex). My day will be Tuesday, July 26. Here's a sneak peek at what I've been working on. 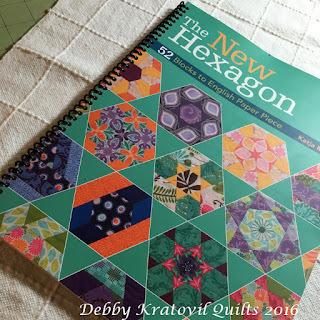 First, I've been smitten by The New Hexagon book by Katja Marek. How do I know I'm smitten? I carry it with me wherever I go in the house. Upstairs to my sewing room: cut out fabric, match with papers, put parts in little baggies. Take it downstairs so I can read through it (for the hundredth time) when I eat lunch. And on and on. Here's a block I made last week (Mary Ellen, Block #28), which I upsized and then bound as a little quiltlet. I took this photo outside on my deck where my living Christmas tree "summers." Yes, Mary Ellen is in the branches of that tree! This Benartex fabric collection was from last year: Seasons Greetings. 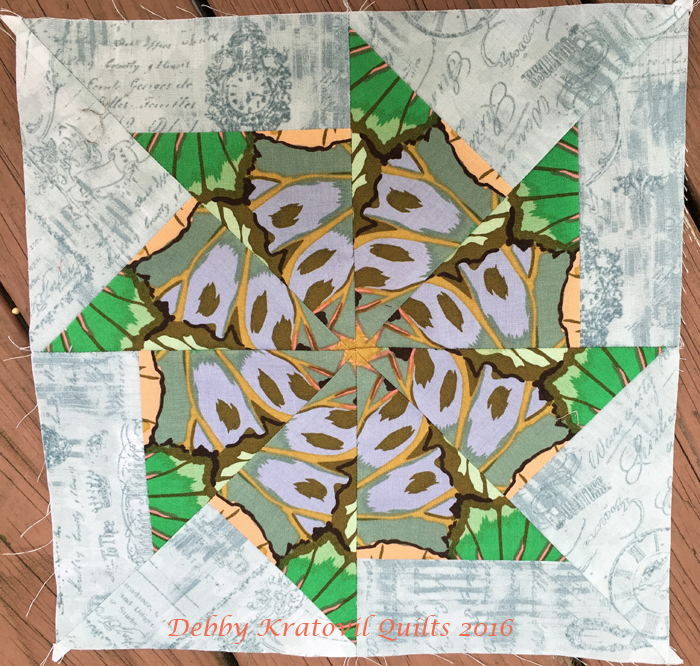 I discovered that one of the prints (the center of this block) has snowflakes all over. And we know how many points a snowflake has, right? 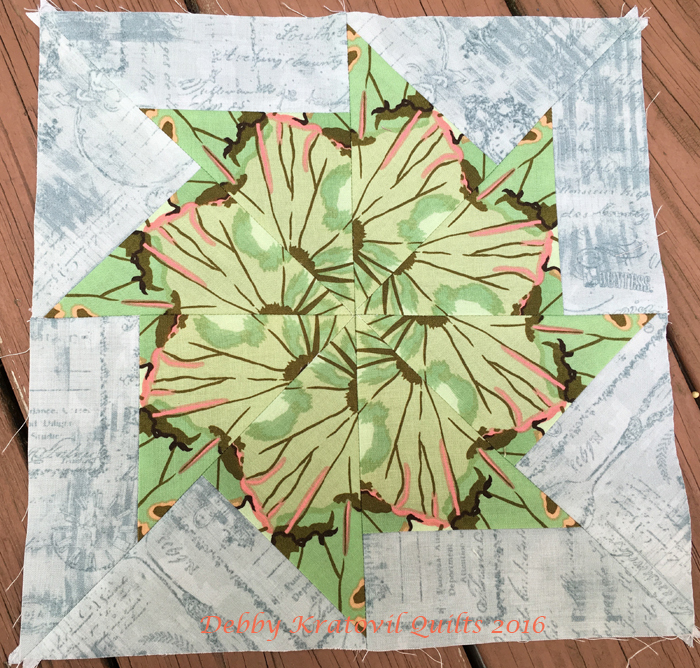 SIX - a hexagon. Pretty awesome, huh? You can see my blog post about that fabric here: Seasons Greetings Tutorial. 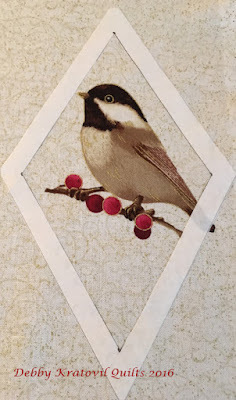 My blog post will be Tuesday and I will be showing several things I made with My Little Chickadee by Jackie Robinson. 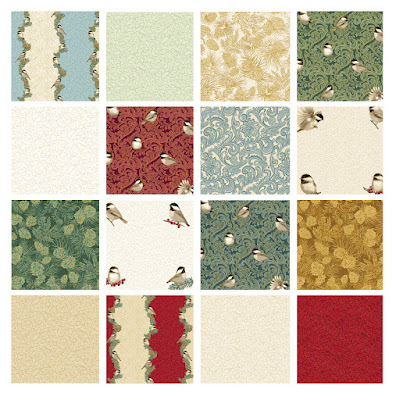 Yes, I will have several more English Paper Pieced blocks, but also a project made with these lovely and sweet fabrics. Here's the schedule for each day this week. I will have this on my blog each day. Hope you can visit each of the bloggers. 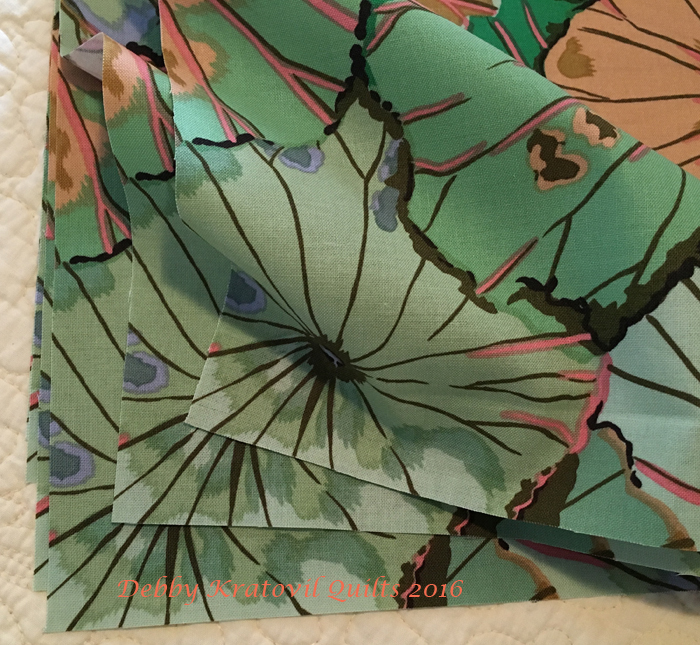 There is a FABRIC GIVEAWAY for each day. Need I say anything more? 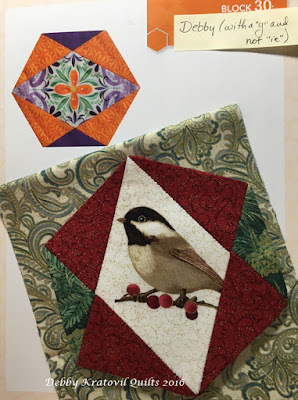 Hope you can stop by to get some inspiration for your Christmas/Holiday stitching! 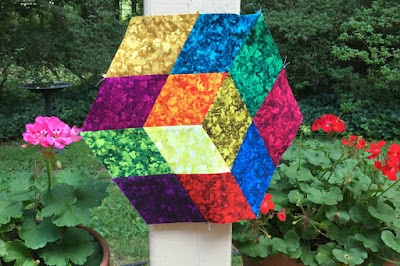 Do you remember those Kaffe Fassett blocks I showed you a few weeks ago? 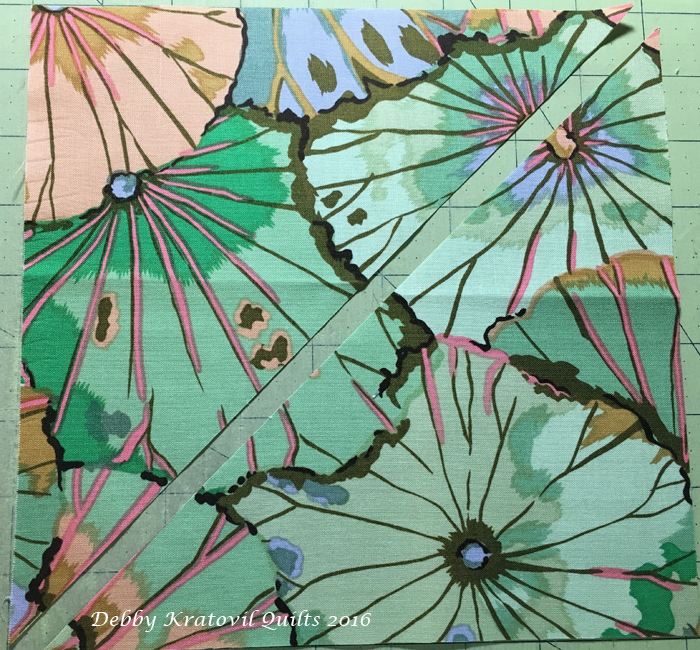 I cut 8 identical squares from the Lotus Leaf fabric and then cut them into triangles. 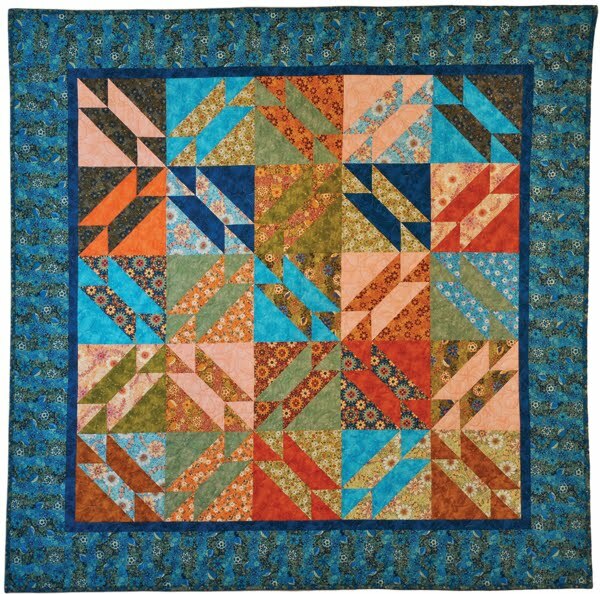 Each stack of 8 triangles worked their magic and became such unique blocks. A real WOW technique that I've been using for about 15 years. Let's recap some of the blocks and then I'm going to show you how to set them on point. And let you see how I cut the "wrong" fabric and had to start all over. And one more. 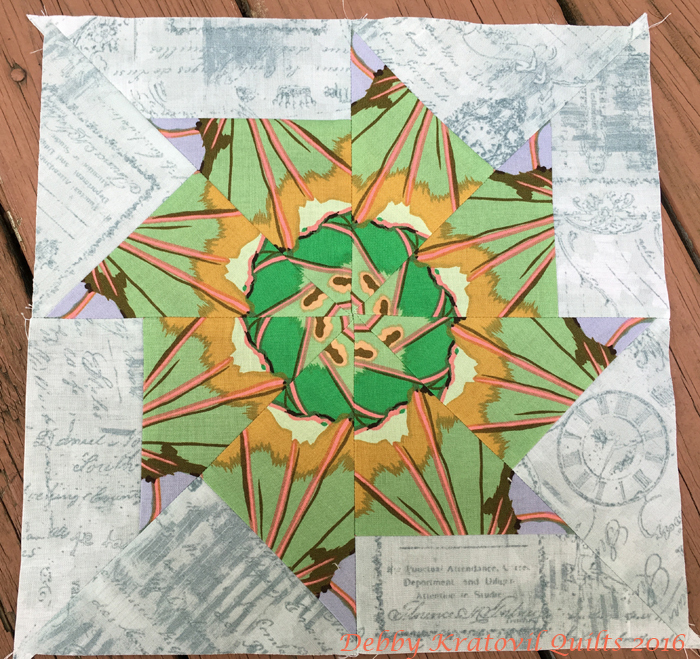 You can see the entire tutorial here: Spinning Pinwheels. I want to set these blocks on point. That means I need TWO different sizes of triangles. 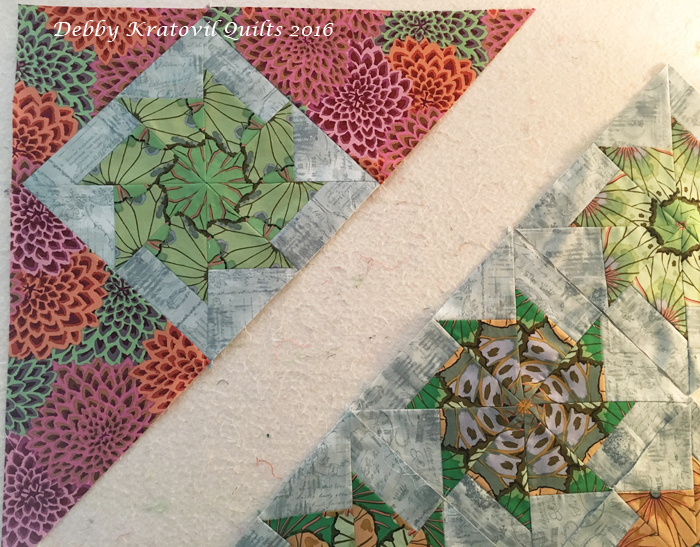 One size for the four corners and one size for the sides. I will share my CHART for cutting these for ANY SIZE block later. 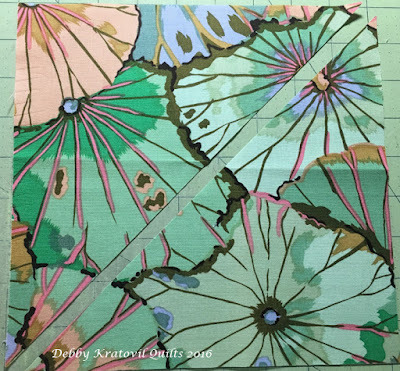 For now, I began with more of that Lotus Leaf fabric. 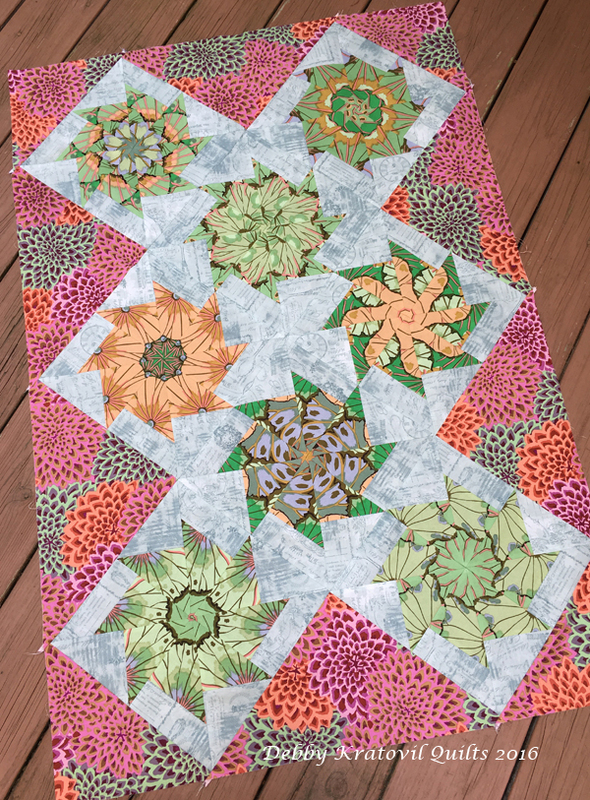 My blocks are 11-1/2" unfinished. That means they will finish to 11". 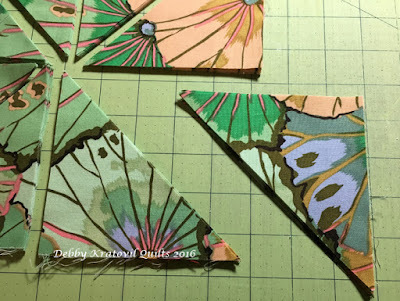 For that size block, I need to cut TWO squares 8-3/4" and then cut each into two triangles (for a total of 4 corner triangles). Why? 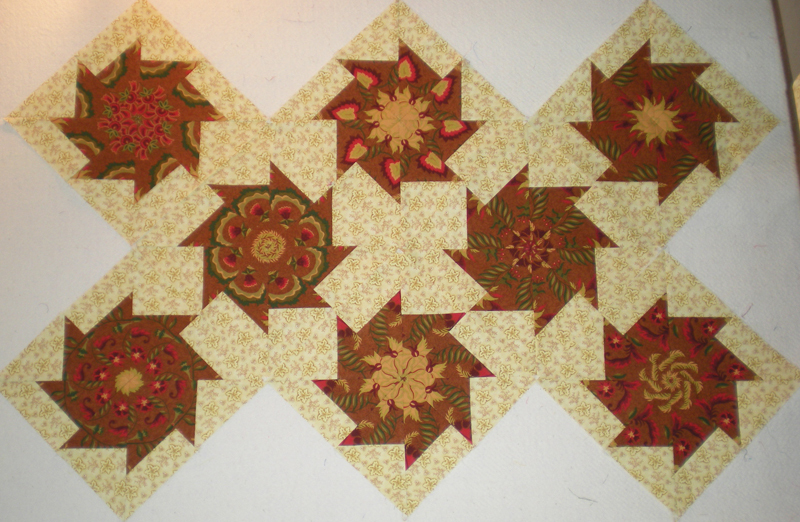 Because as you can see above, the bias is on the inside which will be stitched to the block. 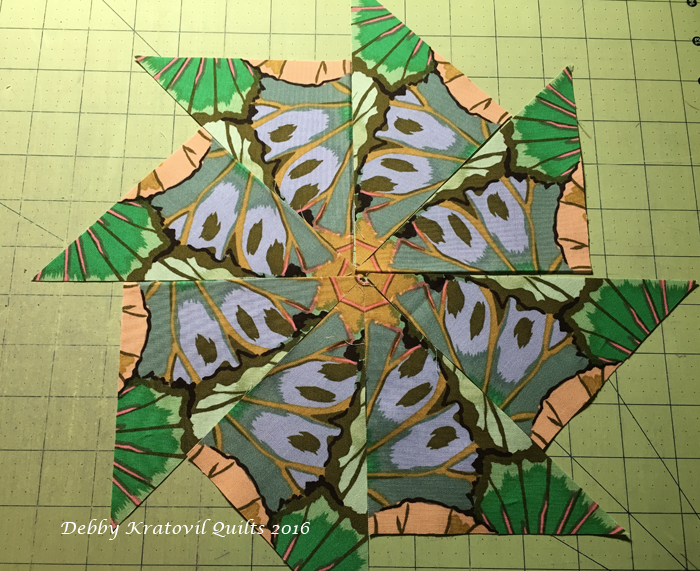 The outside edges are on the straight of grain and there will be NO BIAS on the outside. 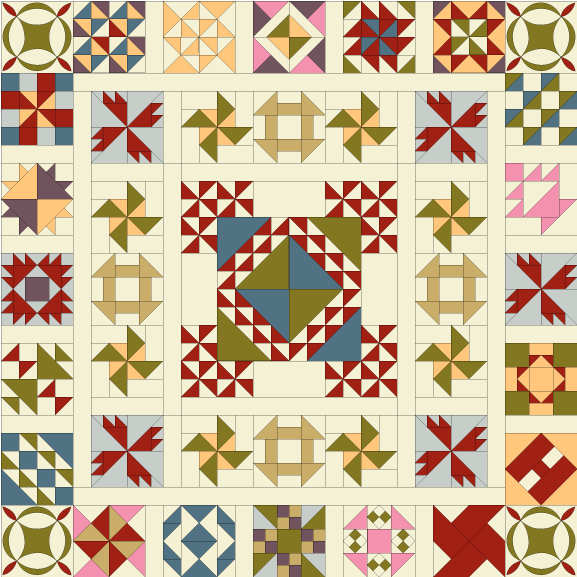 The formula is (and don't roll your eyes): Finished block size DIVIDED by 1.414 PLUS .875" (for corner triangles). Chart link is below - don't panic! 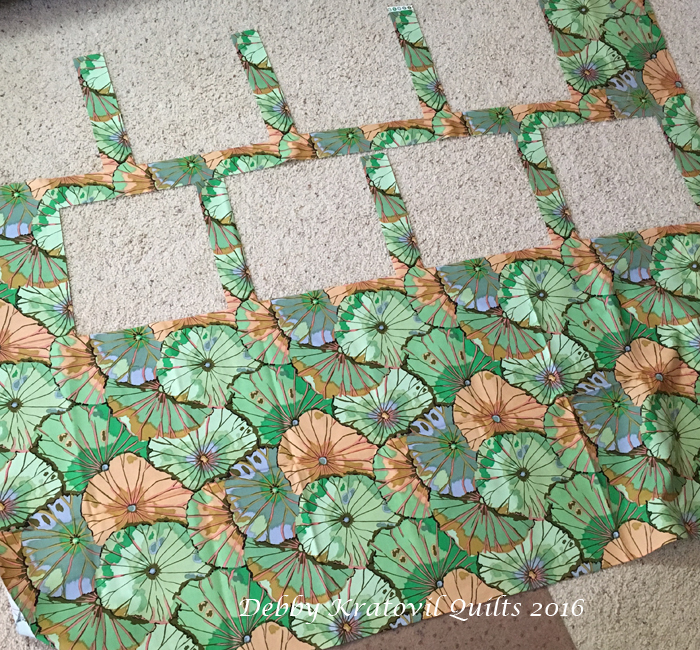 For setting an 11" finished block on point, I need 17" squares, which will be cut into four equal sized triangles. I need 6, so I cut two 17" squares. 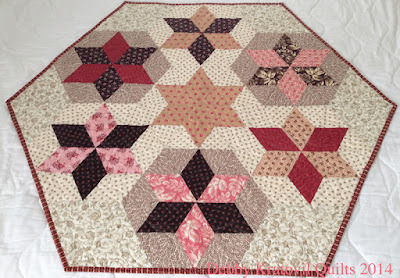 This way the LONG outside edge will run along the outside of the quilt and again, no bias. 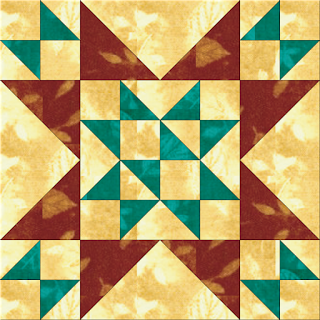 The formula is: Finished block size MULTIPLIED by 1.414 PLUS 1.25" (for side triangles). Now for my "mistake." Nothing to do with the size. It all has to do with TOO MUCH GREEN! I didn't like it. 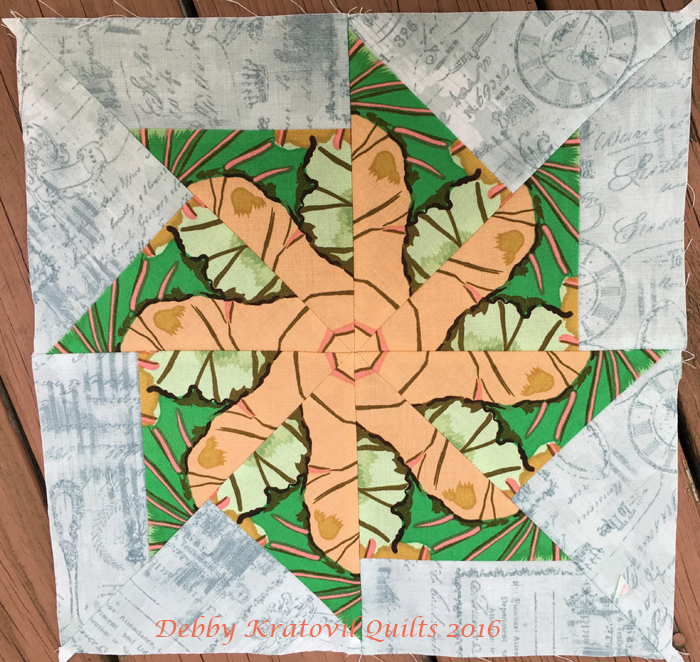 I sewed a corner triangle and two side setting triangles to the top left block. The other setting triangles are just hanging out. I didn't like it! I'll let you in on a little secret: if you don't like the way one block looks, what makes you think you'll like 8 of them? 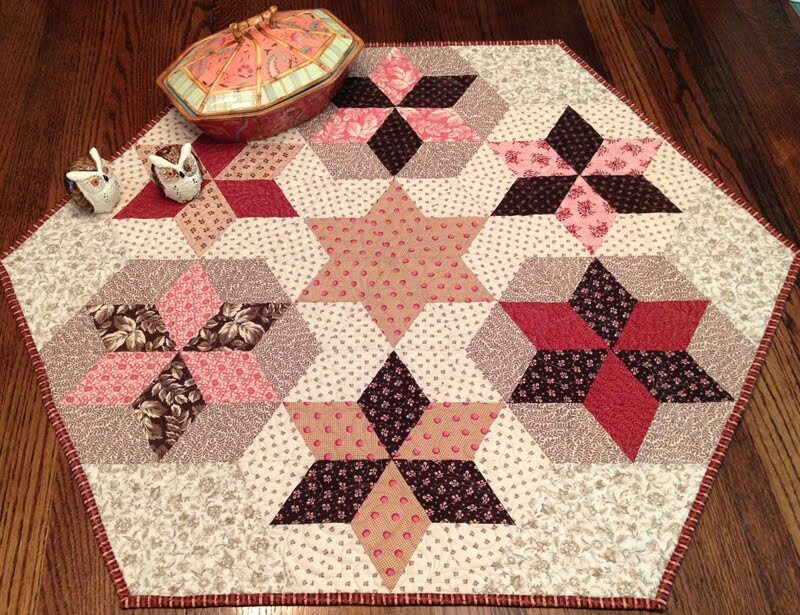 I took the triangles off and put away all that fabric. Yes, I did! It's only fabric! Then, what did I do? 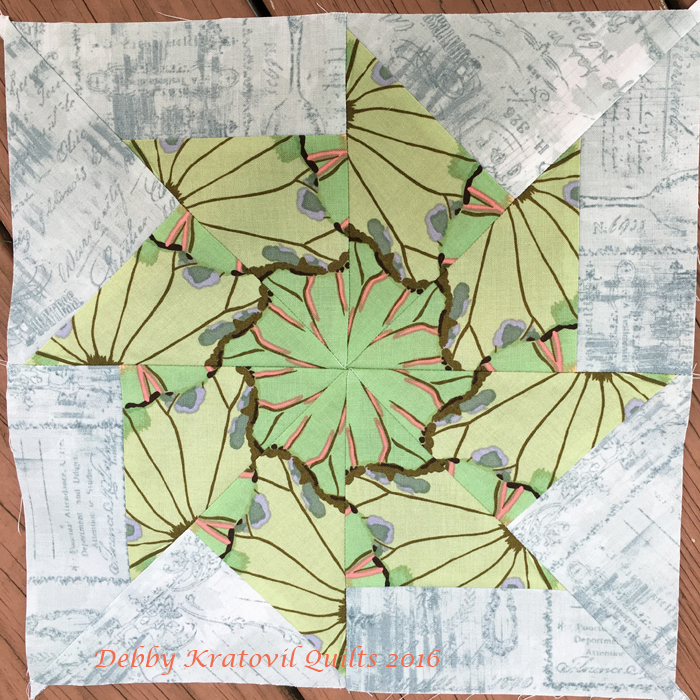 I rummaged around in my KF stash and found another lush print and cut that up. Better contrast. 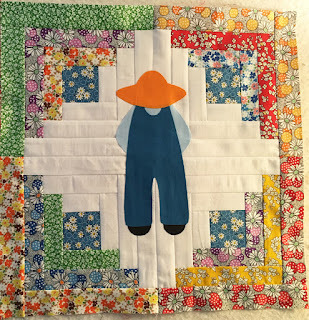 It's my quilt and I have to make myself happy, right? 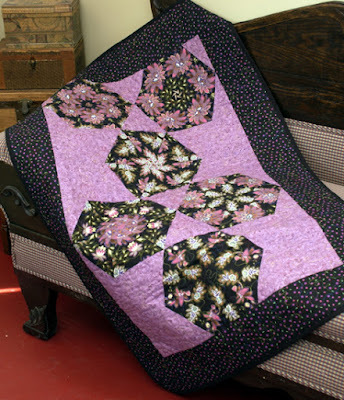 And what does the finished quilt center look like? Allow me! 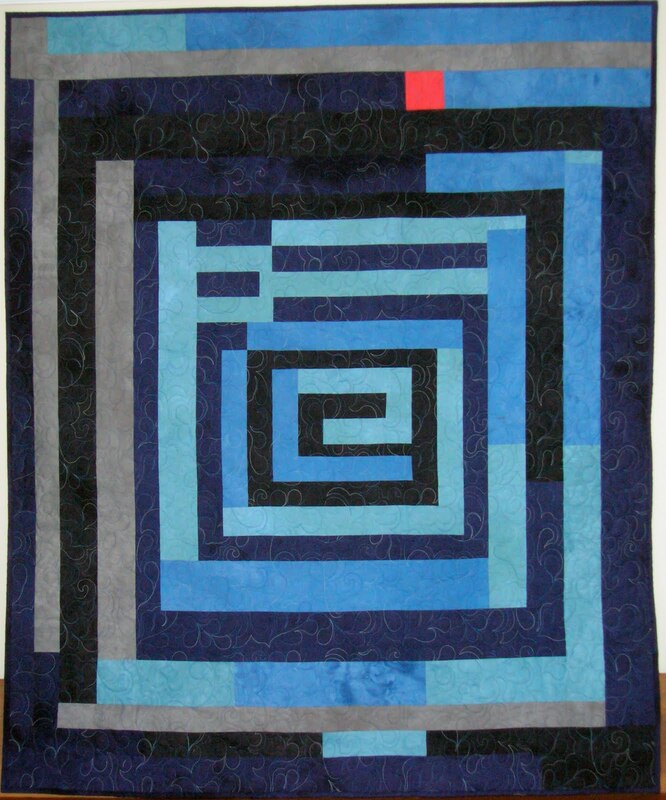 Magic Spinning Pinwheels quilt center: 31" x 47"
Now for my amazing, magic chart: Setting Blocks on the Diagonal. You are free to share this but PLEASE leave my name on it. I realize that some of you will roll your eyes into the back of your head (permission granted). 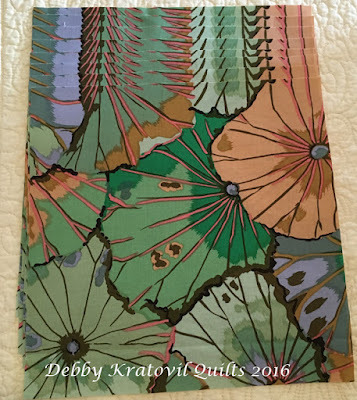 1930s fabrics and patterns? So "old school." 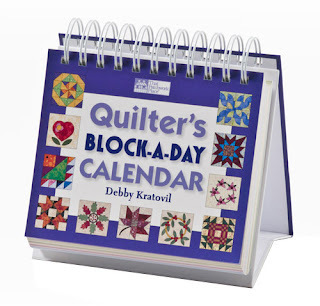 But there is still a strong (though small) group of quilters who love these things. 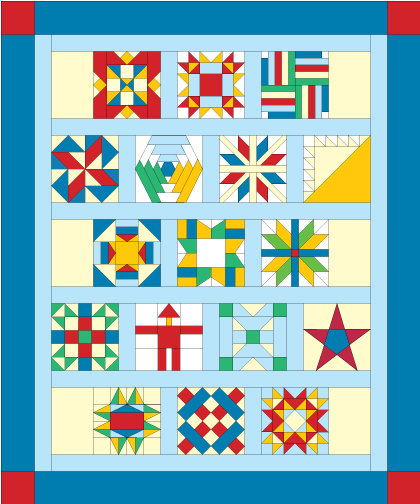 This is my latest pattern with Keepsake Quilting catalog. What do you think? The background Log Cabin blocks are 8". 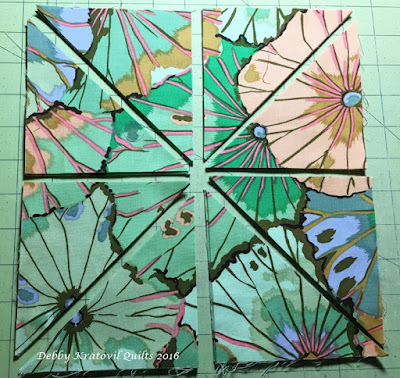 Four together form the background for the 9" appliqué patterns. No border. Finishes to 48" x 48". And let's not forget Overall Sam! 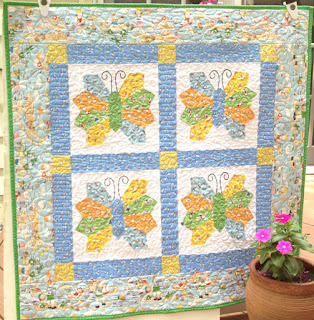 Keepsake Quilting offers both the pattern and the pattern PLUS fabrics as shown in the quilt (ie, a kit). I know which one of my daughters will claim this (once I get it back). This is a fun scrap quilt. 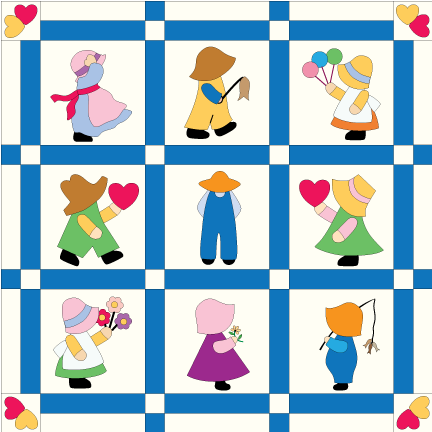 And we know that Log Cabins and Sunbonnet blocks will never go out of style, right? 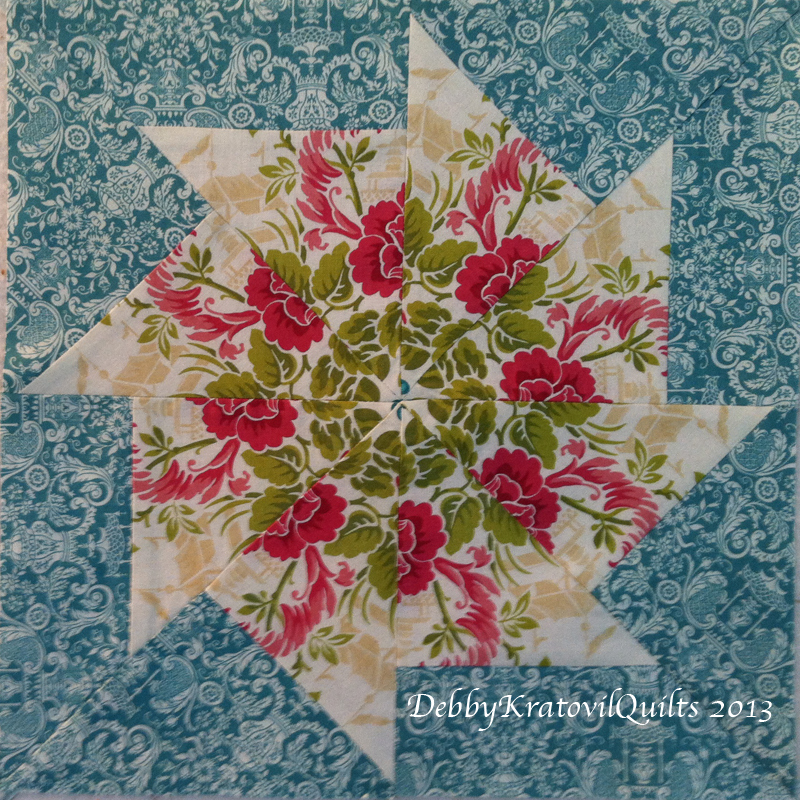 I love color and was asked by Benartex to create an updated version of a traditional block. 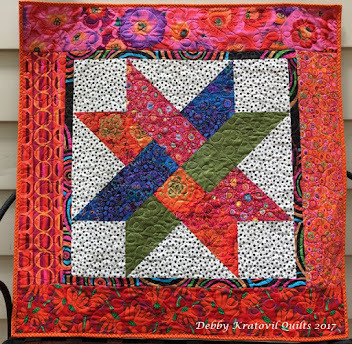 I immediately thought of Seven Sisters because I have been teaching that as a workshop for the past 2 years. My sample is VERY traditional looking, don't you think? With the bright Stained Glass and Ruffles fabrics and a neutral gray, I came up with this take on Double Star. 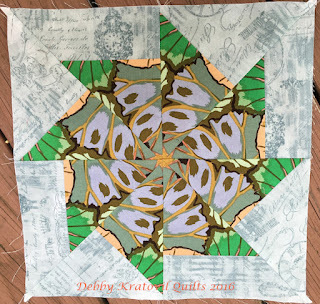 It appears in the current issue of Modern by the Yard. 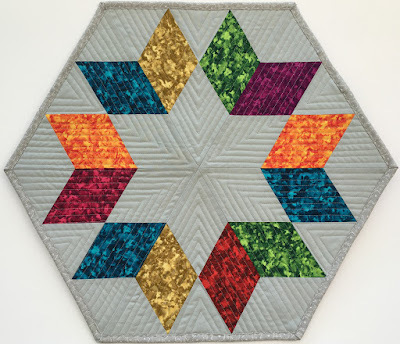 You can read about this quilt (and get basic directions for cutting and stitching it) and see several other awesome and modern quilts and projects by visiting the Sew in Love with Fabric blog. The link for the online eMagazine is at the top right sidebar. 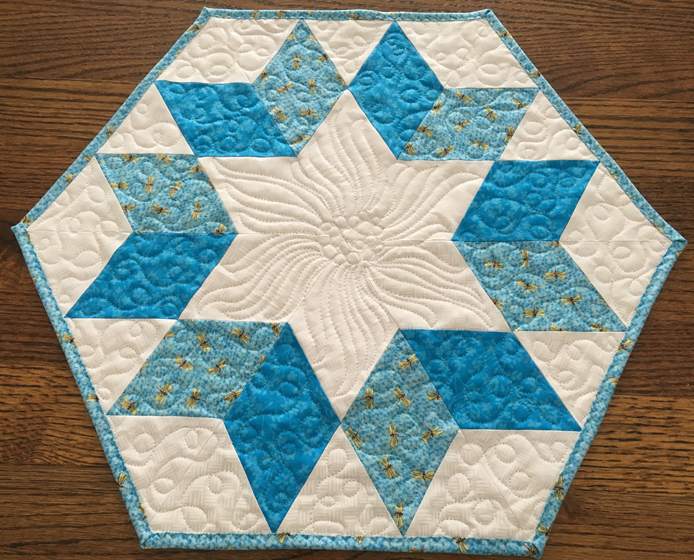 I have a small pile of these 3-1/2" diamonds left over and decided to make a block from The New Hexagon book by Katja Marek. This is block #27, Victoria. 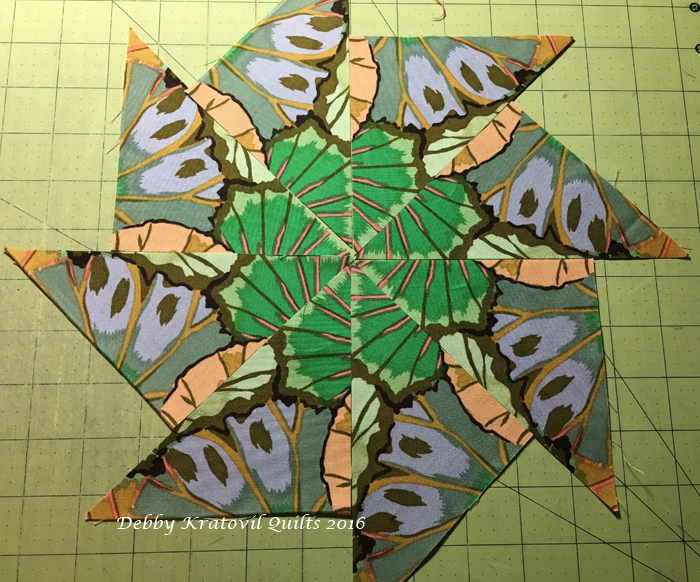 Because these are rotary cut, the size of the diamond from flat side to opposite flat side is 3" finished. The block is now 12" x 13-1/2" (once it's finished). 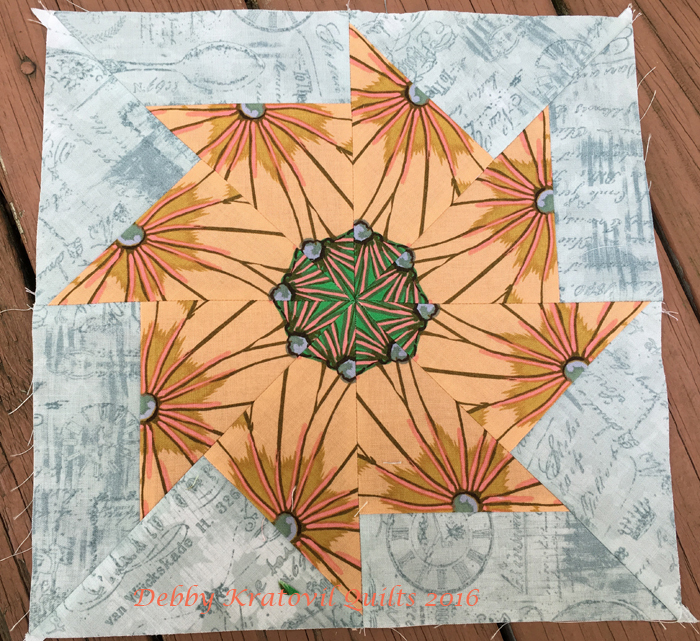 There is only one y-seam, so I didn't sweat too much! I am in a diamonds mood and have several other creations to share in the coming weeks. But for now, go get inspired with Modern by the Yard! 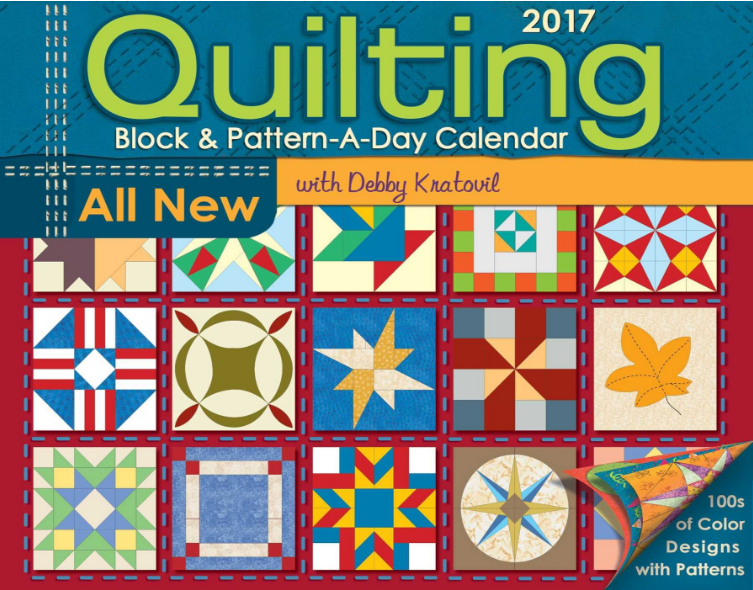 2017 Block a Day Calendar is Here!!! Yes, I still create these. Every. Single. Page! I hole up in my computer room day after day after week after month for about 5 months to meet the deadline. Not every waking moment, but let's just say a few hundred hours . . . Draw, assemble, layouts, fabric calculations (the old fashioned way with paper and pencil. I don't trust an Electric Quilt computer program). 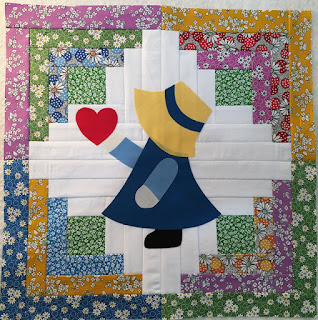 And how about a Sunbonnet Sue and Overall Sam quilt? And this is the first of three quilts (scattered throughout the calendar in order to break up the 50 blocks) in Hey, Hey, USA! 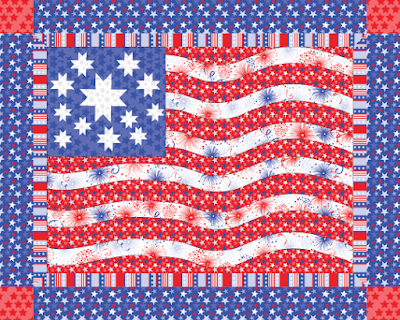 I have blocks for all 50 states, plus Washington, DC. These are paper pieced. 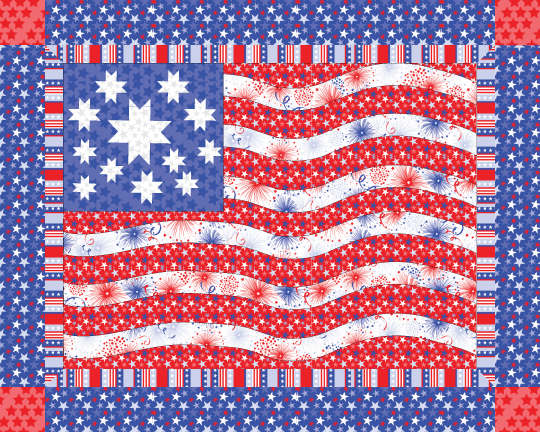 I'm thinking of using the Civil War Sampler (26 blocks) as a Quilt Along on Facebook. Everyone would have to have their own copy of the calendar and as you make your blocks you can post them on the page. Is there any interest there? 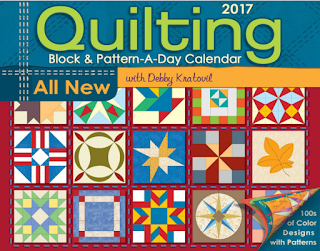 The calendars are available on Amazon ($11.49 Prime - retail is $16.99) and in a variety of quilt shops. Amazon has an August 2 availability date. Barnes and Noble also has the same price and availability date. I even think Keepsake Quilting might carry it in their Fall catalog. I have a limited number for sale, but I really can't beat Amazon's Prime price. Mine is $12, plus $6 postage (Priority Mail because it's so heavy) and only in the United States. Send me an email if you're interested. 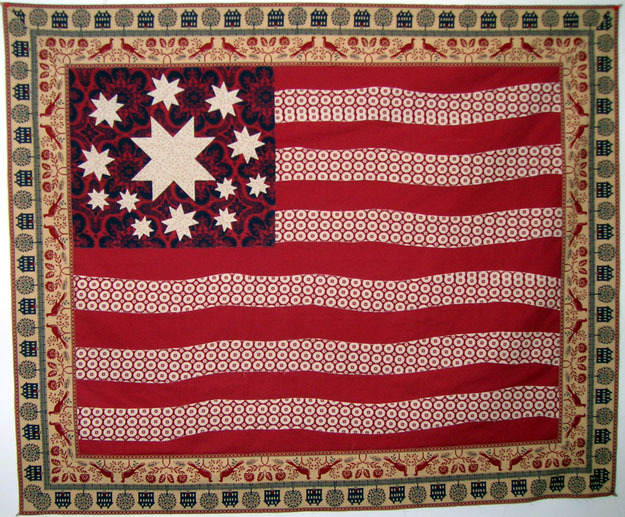 Anyway, let me know your thoughts on the Civil War Quilt Along and I'll start to set it up and sew up the blocks. This was designed by Leslie Sonkin and then sent to me to pattern and sew. 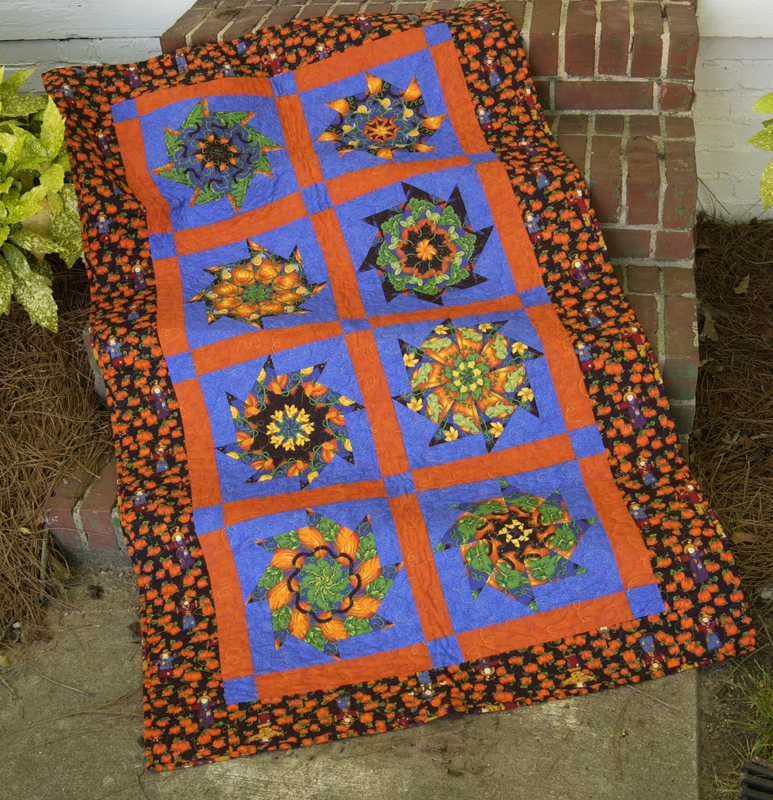 All I need is a sketch and I can pattern just about anything (Windham loves me for that). Isn't this a beauty? 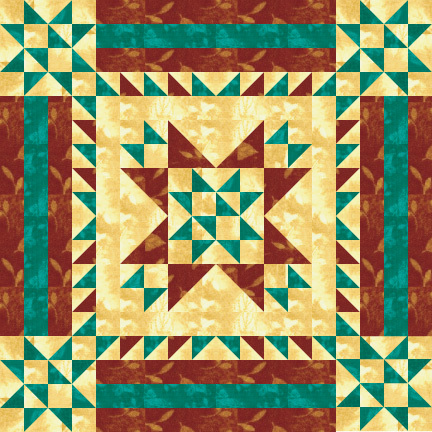 Windham decided to reissue the pattern and I created a digital quilt using the same pattern. Would you like to see that? 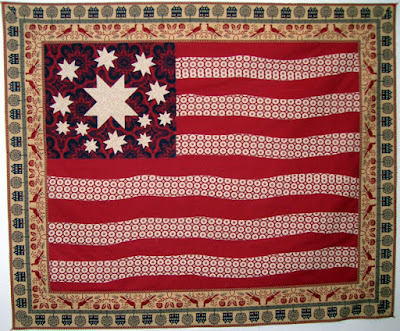 This uses their new Stars and Stripes Collection. The pattern is free. The piecing is not hard. 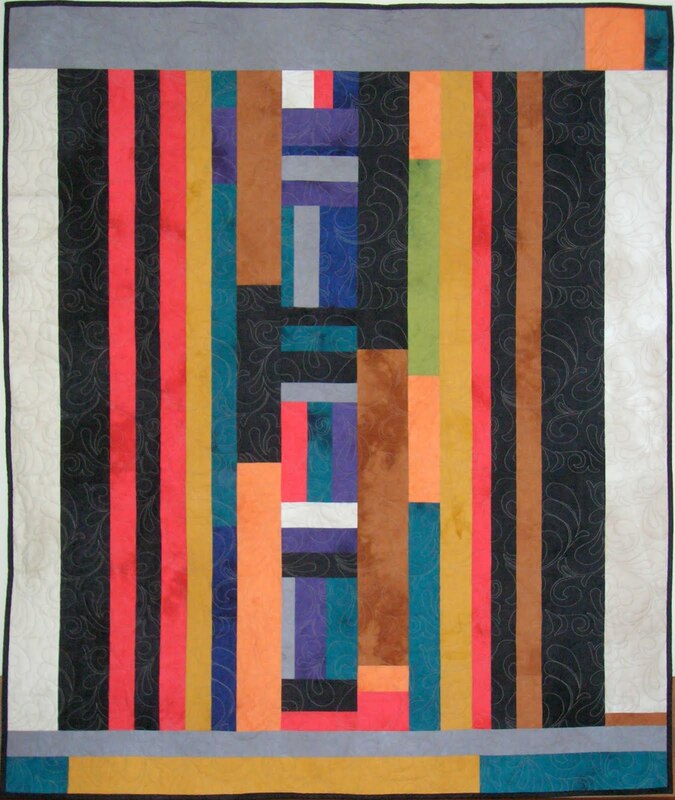 Those wavy stripes are NOT pieced, but raw edge appliqued to the red background fabric. 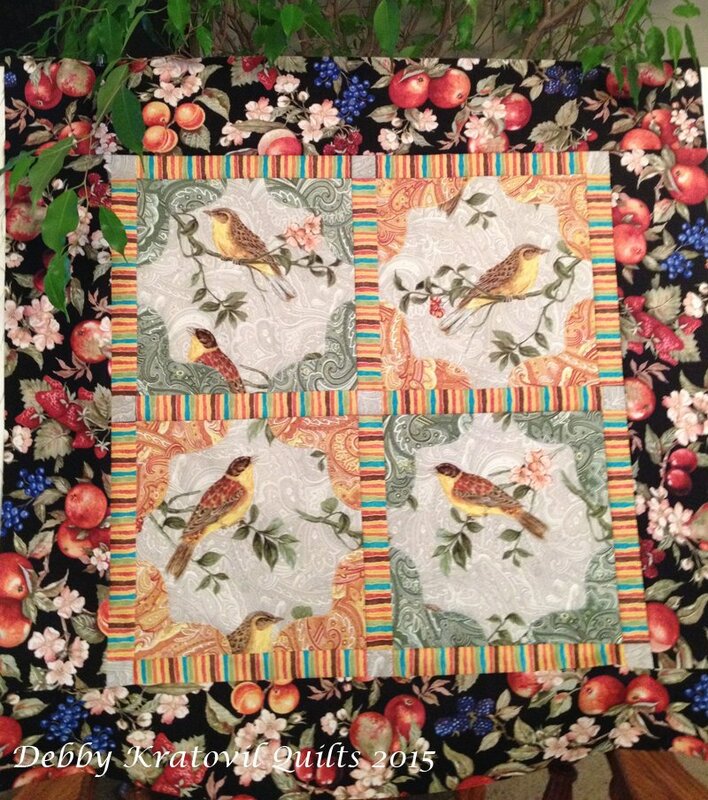 Hope your weekend is filled with enjoyable things, including quilting! 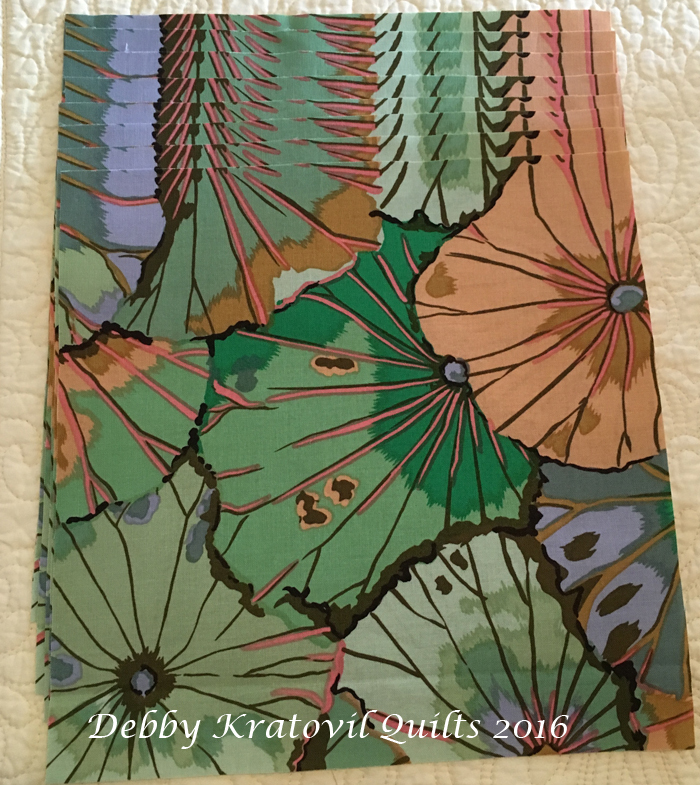 Do you have a pattern that you come back to more than once? It intrigues you and each time you make it you find a completely different outcome? That's how I feel about this Spinning Pinwheels. 8 identical squares cut 9-1/2"
Let's see my previous posts. Click on this Chinoiserie link to see some amazing blocks - all so very, very different from each other! And my second one using $1 a yard fabric from Walmart (yes, 15 years ago Walmart had a fabric department). 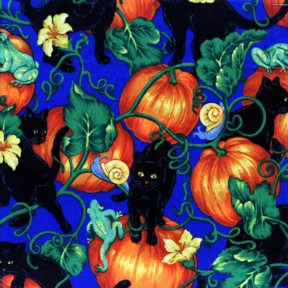 One piece of wicked kitties with pumpkins, frogs, bats and all sorts of other things created this awesome quilt! 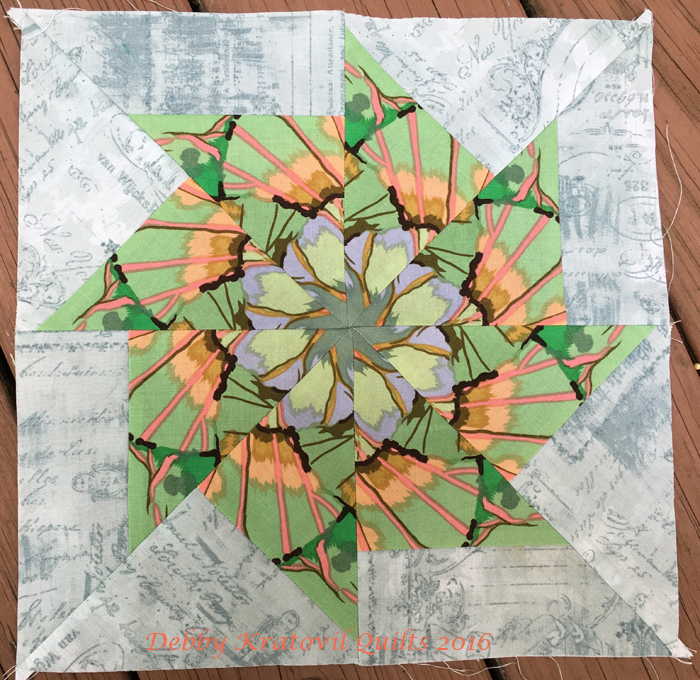 I cut 8 MATCHING squares (9-1/2") and then used my method as described below. Now let's see what I did with those Kaffe Fasset prints from above. 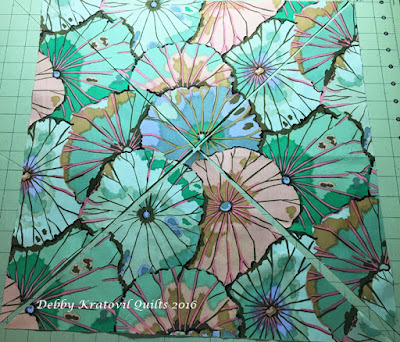 Remember, I am working with 8 IDENTICAL squares of fabric that I cut from a large scale print. I used my 9-1/2" square acrylic ruler. This is NOT Bethany Reynold's method of Stack 'n Whack. This is NOT the One Block Wonders (because this predates that by 10 years). And you can see details of how to cut and stitch using the links above. And the holes I put in the fabric? 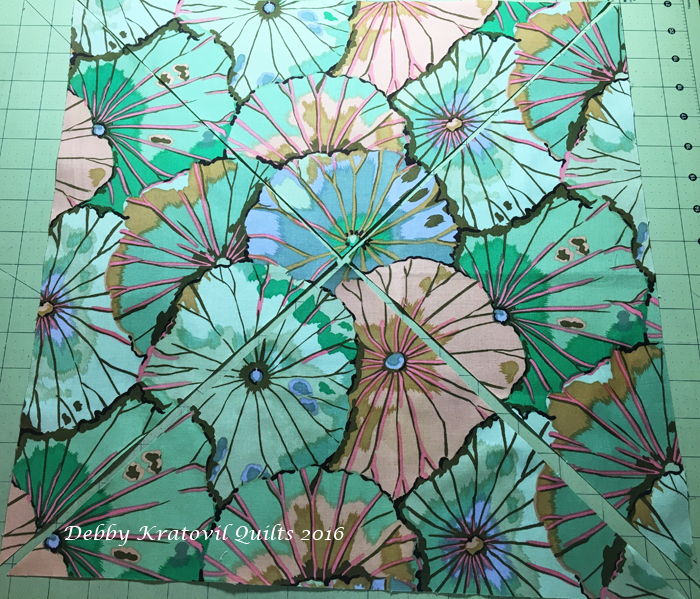 The fabric I chose and the square holes I left! I chose a light blue print for my background. You can find all of the dimensions and cutting information at the tutorial I shared back in 2013. Both HERE and HERE. Can you imagine how awesome some other blocks will be using a large scale floral? You can't over think these things. As you can see, you really can't go wrong. And there's no way you can determine the amount of fabric you will need. But using a 9-1/2" square worked well. My blocks will finish to 11" and I will set them on point using the rest of that floral fabric for the side setting squares!